Here I am again with a brand new WordPress tutorial! 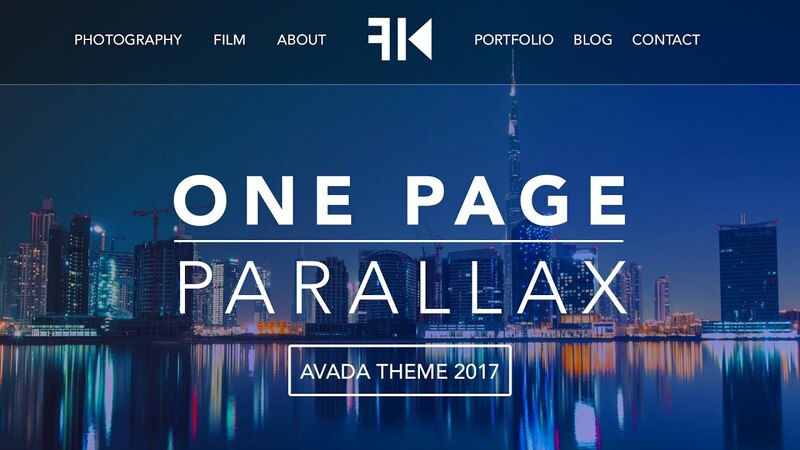 We are going to make a beautiful parallax one page website using the Avada theme. The Avada theme – one of the best WordPress themes – came with an amazing update that provides us with an even greater user experience! Let me walk you through all the steps in order to help you make an amazing WordPress website using the Avada theme! The Avada theme has a great visual composer called the Fusion Layout Editor. It makes creating webpages so easy! In this tutorial I will walk you trough the process of making a website. How to use containers, columns and elements. How to import part from a Avada Theme Demo Website and configure it to your wishes. How to clone part of your website. Making a website with the Avada Theme saves you a ton of time! 48:51 Create the photography area using a text block, import a portfolio grid, create a few portfolio items, create a parallax background and adjust it to your wishes. 1:55:14 Create the ‘Contact’ area in the one page by importing it from a demo website. 2:30:00 Change the dates on blogposts and portfolio items and schedule posts. 2:32:28 Thank you for watching and congratulations with your One Page Parallax Website! I used to have a love/hate relation with websites. When everything worked out I loved it. When I could not fix some problems I hated it. I wanted to become the solution that I needed when I got stuck at WordPress. That is why I created this platform. The most paid services I offer on this website are affiliate links. You don’t pay more but it gives me a commission when you buy it through my affiliate link. Thank you for the support!